Is Facebook Cracking Down on Cover Photos? Since stories regarding Facebook’s photo policies began surfacing earlier this winter, the case of the disappearing cover photo has become widely noticed among page admins and personal users alike. Everyone from Twitter users to several Mashable staff members have reported their images vanishing. Most of the images in question were promoting brand content, such as movie releases or TV show premiers. This could be quite worrisome to the many businesses, big and small, benefiting from the social media interaction with their fans on Facebook. Did you know, for example, that you aren’t aloud to include your website address on your cover photo? Is Your Page in Violation of Facebook’s Policy? After Envigor caught wind of the disappearing images, we thought that we’d help put our reader’s minds at ease by reviewing the polices Facebook has in place regarding cover photos. 2. Images may not include “price or purchase information”, including the actual price, sale percentage, or directions to where you can purchase the products from. It is also important to realize that by utilizing Facebook’s service you are essentially agreeing to all of their terms. You can brush up on them here if you need to. Are you a Facebook page administrator, or even a personal user that has had your cover image yanked? Do you think Facebook is being heavy-handed or just maintaining the integrity of their site? Let us know in the comments! We'd love to hear from you! Leave your contact information and message below, and we will be in touch soon. Serving the web, print and identity design needs of Muskegon, the Greater Grand Rapids area, West Michigan, and beyond. Envigor Design did an awesome job with our company's website. They put together a great site in a timely manner and provided quick and thorough responses to all our questions/requests. All of this was provided at a reasonable price. They are very pleasant to work with and I highly recommend them. Thanks Andy and Amanda! Andy and Amanda of Envigor Design were amazing to work with in designing our new website. We continue to use them for print materials as well. They clearly layout the process and work very hard to make everything very easy. They continue to exceed our expectations! The White Lake Area Chamber of Commerce highly recommends Envigor Design! It has been a great experience working with Andy and Amanda as they designed and created our new logo and website design. They listened to what we needed in a site and have responded in a timely manner to complete the project. We are very proud of our beautiful web site plus it is user friendly for our members, community and visitors. They are both very communicative, patient, innovative and professional. We enjoy having a continued working relationship with them still today! The creative folks at Envigor have helped us establish an attractive web presence that provides excellent information and customer service. Andy and Amanda helped make our vision a reality through their excellent questions and design talents. In addition to leading our site creation, they have provided excellent support services and have been willing to help us problem-solve and keep us up to date and relevant. 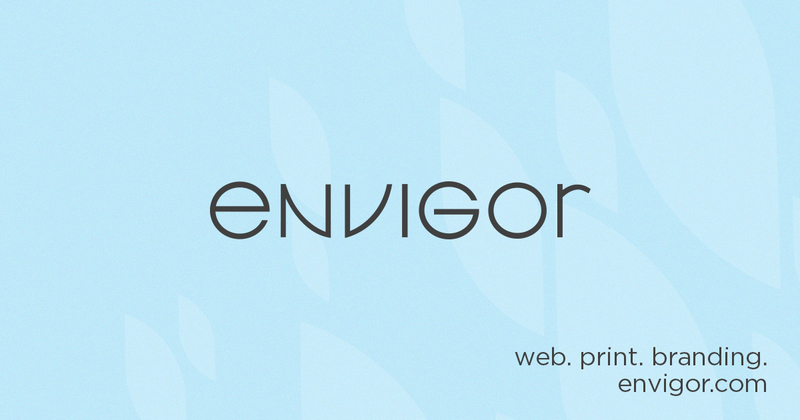 We enjoy working with Envigor and highly recommend their services. I was referred to Envigor from another website developer that couldn't help with our project. Andy and Amanda were great to work with - heard what I was asking for and put it out there. The support we've received since going live has been great. I would and have recommended them to others! Andy was extremely professional and easy to work with while designing our website. The website turned out great and Andy and Amanda are both great at getting back quickly when I have a question or need some help. I found Envigor through a side project they did on Etsy. I was looking for a designer for a website and marketing products. I'm on the complete other side of the country from Envigor. They were fantastic. I've never worked with a graphic designer before, but I can't imagine the process going any smoother than it did. It felt like Amanda was beside me as I opened my business. She was smart, professional, and put up with my mood swings gracefully. (I would like the logo one day, and then email her back the next day saying I didn't.) I could not have asked for someone more responsive. Emails were always answered immediately, with usually more information that I expected. Envigor delved pretty deeply into what kind of branding would best play to my business's strengths, and created something beautiful. I can't recommend them highly enough.